If you’re one of the noisy minority who have taken to playing Stolen (iOS-only) since it launched at the start of the year, then you’re probably happy enough with the premise of the game: use virtual money to trade ‘ownership’ of Twitter accounts, and anyone with more money can simply usurp your ownership. Fun and games, it may be, but some people don’t really like the idea of their digital persona being ‘owned’ by a stranger – or worse, being assigned an uncontrollable nickname within the game, which is also possible. Now, to help these folks out, it’s possible to opt out of the game (whether you’ve played it or not) but there’s an ironic twist for anyone who wants to opt out, but has never played: you need to give Stolen permission access to your Twitter account, including permission to post on your behalf. A game I don’t like the sound of is now asking for access to my Twitter account, so that I don’t have to be a part of it in the future. It’s flawed, horrible logic that I can only hope the company rethinks in the imminent future. After reaching out to Stolen, CEO Siqi Chen said that the app now only requires read permissions to be in effect. 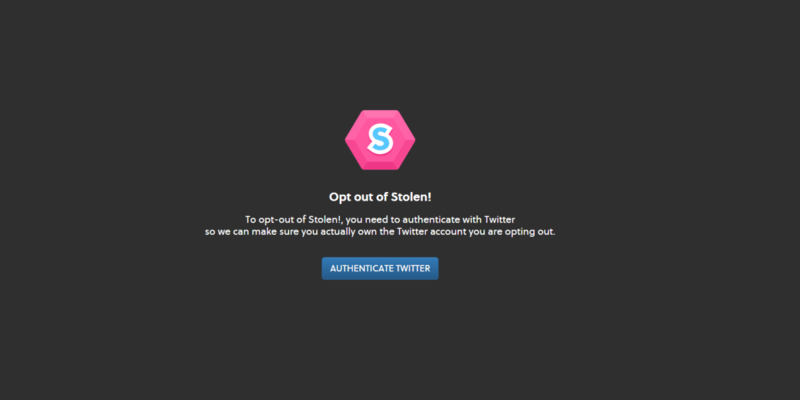 If you’d still like to opt-out of Stolen but don’t want to give them Twitter permission, Chen says contacting the app directly via Twitter will be sufficient.